There are several key steps in the process of editing your book. The book publishing industry is going through a huge transition. It’s easier than ever to get a book out into the world. All the resources you need to publish a book are available you. You no longer need to go through the traditional gatekeepers (publishers) to publish a quality book. Because it’s so easy to publish a book and get it out to market, authors sometimes skip the critical part of editing. No matter how good of a writer you are, you need to hire an editor. If a book has too many typos, readers typically stop reading. Not having an editor go through your work is like sending an untested drug out to market. "Not having an editor go through your work is like sending an untested drug out to market." So, you’ve written your manuscript and have gotten feedback. You’re now ready for the next step in self-publishing: hiring the right editors. Different editors perform different job functions. I’ve compiled them below to make sure you pick the right person for your work. A developmental editor will take your manuscript and work with the content itself. If needed, they might reshape your work and rearrange sentences to make the book flow together better. This type of editor helps an author find their voice and help refine their vision. When looking for a developmental editor it’s important to choose one who has experience in your genre or specializes in your book topic. Don’t pick a travel editor for your romance book. 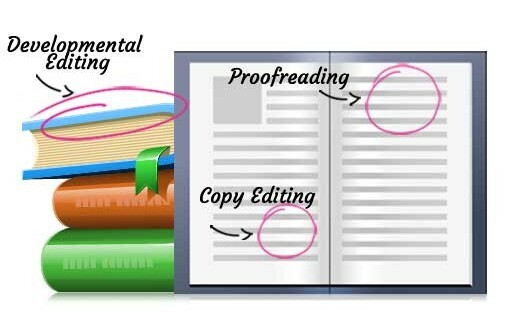 If the editor has only edited magazine articles it might not make sense to have him or her do a developmental edit for your book. Working with an editor who you connect really well with is key. Sometimes, authors hire someone without speaking on the phone or getting a sample edit first. I always recommend doing a face to face via Skype or FaceTime. When looking for editors get a list of some of the other works they’ve edited to make sure it’s similar to what you’re looking for. It also helps to interview the editors’ past clients to see what feedback they’ve gotten. Most editors will do a sample edit on a few pages or a first chapter to help you get a sense of their style. Developmental editing can also be called substantive editing/heavy line editing. When hiring a copy editor make sure to get a list of the work they’ve copy edited. Hiring a magazine editor or someone who edits articles works fine in this scenario because they are mostly checking for syntax, grammar and other errors. Always ask your potential editor to do a sample copy edit of your manuscript to make sure you agree with their changes. Before you work with anyone make sure you check their LinkedIn profile and checked out their reviews. When working with anyone it’s best to agree on timelines and a payment plan up front and ask a lot of questions. Editors will usually do sample edit for free but usually require a deposit before they start work. If you’re the type of person who likes to meet face to face, then hire someone local from your area. By making sure you hit all the editing steps you CAN get publisher-level quality for your self-published book. I have to disagree about the copy editor–magazine editors and article editors work primarily with AP style, while book editors use the Chicago Manual of Style. Many authors are surprised by the many differences between the two, so if you’re writing a book, choose an editor who uses the Chicago Manual and has experience in book publishing (unless it’s academic, then consider an editor well-versed in APA style). found the article interesting and more importantly succinct. good review (although it does for some reviewers). to nurture new talent or books that may only sell at low or even mid range levels. (the gate keepers as Miral has called them) have lost the keys to the kingdom. I hope that the editors do not become the “new gatekeepers”. Editing shouldn’t cost anywhere near $30,000. That’s the cost of GHOSTWRITING. If you hire a developmental editor/book writing coach, you should be able to get away with much less than that. Developmental editors and ghosts I know will work with a client to determine how best to help given the client’s budget limitations. Then, yes, you’ll need professional copyediting and proofreading but these shouldn’t cost tens of thousands of dollars. You’re absolutely right about typos. It’s flabby pacing, grammar glitches, poor word choice, etc., that you need to be looking at. Spellcheck and Search and Replace will clean up a lot of smaller things although they won’t catch usage errors. While I agree there is a fine distinction between ghostwriting and developmental editing, they are on very close playing fields regarding rates — and should be. A potential author has the words, but that does not mean they know about structure, pulling it together and making it readable. I have done a couple of Developmental Editing Projects and thoroughly enjoyed being the voice of the author. What I learned is that it IS right up there with Ghostwriting. Naturally this all depends on the author, the subject matter and the length of the written project… but I would not put Developmental Editing into a separate, much lower pricing arena. The article makes some great points, but I don’t know any professional developmental editors who would do a sample edit of your work unpaid. The expectation is that a developmental editors testimonials and previous work stand on their own. You wouldn’t ask a plumber or oral surgeon to provide services unpaid to prove their worth before you decided to engage them. A developmental editor should be able to provide you with a list of previous clients and projects and should be honest about her expertise. I regularly turn down clients I know I’m not right for, and if I do know someone who’s a terrific developmental editor in that genre, I’ll refer the client to that professional. Miral, What’s your email? How can we contact you with questions? Great points! There’s always some overlap, but I love when I get authors who know the vocabulary of editing. Just makes it easier to know what they need. Thanks for doing the education! I understand about price being an issue for indie authors. Some editors, myself included, will work on one level of editing at a time, so the author doesn’t have to pay a lot up front, and only pays for the services he/she uses.